Turkey vowed on Monday to “completely cleanse” Islamic State militants from its border region, after a suspected suicide bomber with links to the group killed 54 people, including 22 children, at a Kurdish wedding. 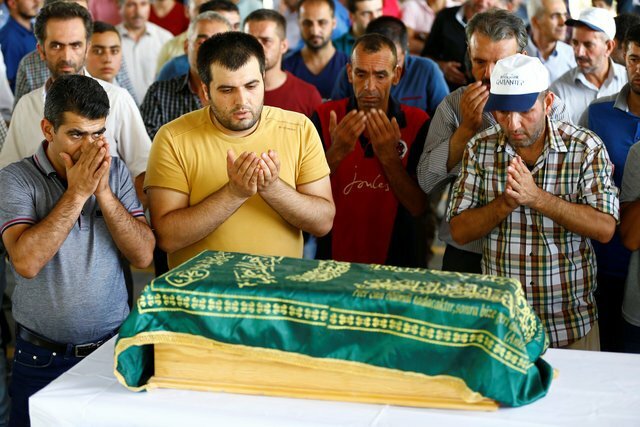 Saturday’s attack in the south-eastern city of Gaziantep is the deadliest in Turkey this year. It was carried out by a suicide bomber aged between 12 and 14, President Tayyip Erdogan said on Sunday, adding that initial evidence pointed to Islamic State. Both of those attacks were blamed on Islamic State. The group has targeted Kurdish gatherings in an apparent effort to further inflame ethnic tensions strained by a long Kurdish insurgency. The Ankara bombing was the deadliest of its kind in Turkey, killing more than 100 people. “Daesh should be completely cleansed from our borders and we are ready to do what it takes for that,” Foreign Minister Mevlut Cavusoglu said at a news conference in Ankara, using an Arabic name for the group. The rebels, groups fighting under the banner of the Free Syrian Army, were expected to assault Jarablus from inside Turkey in the next few days. Reuters TV footage showed around 10 Turkish tanks deployed at a village around 4km from the border gate immediately across from Jarablus. It was not clear how long the tanks had been there. Prime Minister Binali Yilidirm has said Turkey would take a more active role in Syria in the next six months to prevent the country from being divided along ethnic lines. Cavusoglu said Turkey, a member of NATO and the US-led coalition against Islamic State, had become the “no.1 target” for the militants because of its work to stop recruits traveling through Turkey across its over 800km border into Syria to join the Sunni hardline group. The attack comes with Turkey still shaken just a month after the government survived an attempted coup by rogue military officers, which Ankara blames on US-based Islamist preacher Fethullah Gulen. Gulen denies the charge. “It could be that someone was loaded with explosives without even being aware of it and it may have been detonated remotely,” the official said, adding a search was underway for suspected militants who may have played a reconnaissance role. Some in Turkey, particularly in the Kurdish south-east, feel the government has not done enough to protect its citizens from Islamic State. The pro-Kurdish Peoples’ Democratic Party (HDP) said the wedding party was for one of its members. The groom was among those injured, but the bride was not hurt. Sad that a lot if probably innocent young people died. Did he think he could just turn Daesh aggression off and on? Did he imagine that Daesh would be grateful for his help? RIP-innocent victims. Condolence to their families. This has just given Erdogan a perfect excuse for further action against the Kurds. Smell a rat? If Erdowie is to rid Turkey of isil, does this mean that he and his cronies will be leaving two. They support one another afterall. Mr. Erdogan should re-think his strategy of turning Turkey into Islam state. Why are you wasting your fingertips? How can this ever happen? …and I am trying to post something non-sarcastic, too. Sort of practice. “A suicide bomber aged between 12 and 14 carried out the attack”!! !This World is going crazy..